If you’ve been following me on Twitter (@PghTasteBudB), you know that I’m in the midst of making a New Years Eve cake for a party that I’m going to. I figured what is more symbolic for New Year’s Eve than the Times Square ball dropping. 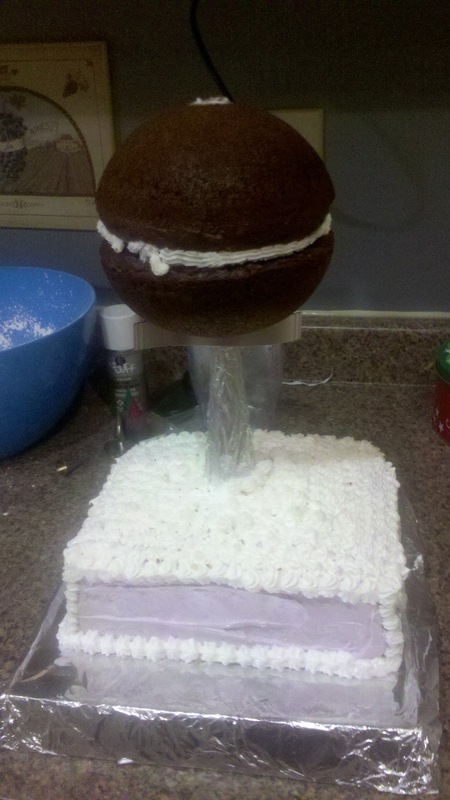 So I embarked on building a New Year’s Eve ball cake. Using boxed cake mixes, I made a two-layer confetti cake base and a chocolate ball top. Thankfully I was able to find a mold for making a sphere at Michael’s just that afternoon. I used a pedestal piece to help elevate the ball from the base as if it were the coming down as the clock strikes midnight. For my first time actually decorating using icing tips, I topped the purple base with stars and thought I was on a roll. Until disaster struck. After some additional designs on the base, I started decorating the ball. Things seemed to be going swimmingly and I was getting the hang of using the icing bags and coloring the icing. 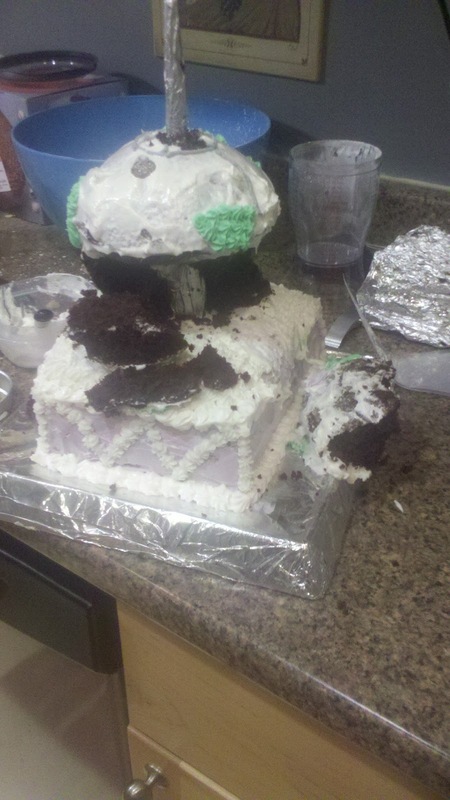 Before long, the weight of the icing on the ball was too much and the cake slide down the pedestal crashing onto the base of the cake. So at 2pm, I packed up the base and decided I was headed to bed for a fresh start in the morning. Not wanting my previous night to be a total loss, I woke up this morning and decided to pay homage to one of my childhood favorite cakes, the “poke cake.” A poke cake is made using a few simple techniques. (2) Let the cake cool completely then randomly poke holes into the cake (I like to use a spoon). 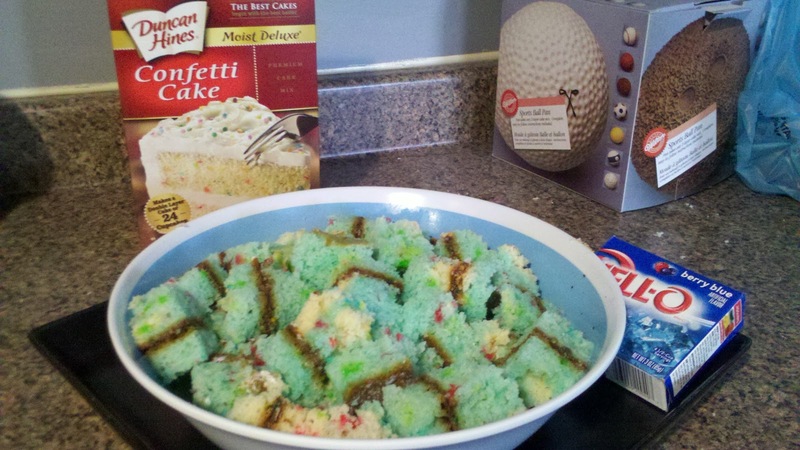 (3) Prepare Jello to it’s package instructions and pour it over the cake. (4) Refrigerate until Jello is set. (5) Top with Cool Whip topping. I began removing the icing from the base of the cake, as if I was cutting the crust off of bread, trimming the sides and discarding the icing. I chopped the cake into pieces and placed in a bowl. I made a berry Jello and poured over the cake pieces.